Omurice, is a contemporary Japanese dish. I guess it’s invented not long ago, yet it quickly becomes a very popular dish around the world. 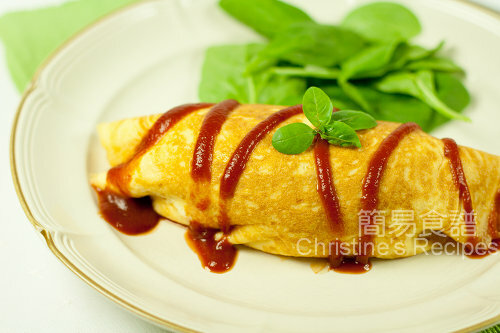 Omurice is a kind of fried rice, commonly cooked with chicken, tomato sauce and ketchup, wrapped in omelette (a thin sheet of fried egg). In every Japanese restaurant, you’ll easily find this dish on their menu. 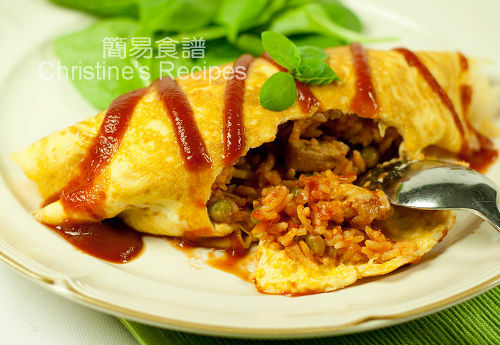 Some restaurants even create their own variations of fried rice inside the omelette, with different meats and flavours. I like to cook this dish for my family, not only because it’s easily cooked, but also can I put all the delicious and healthy ingredients inside. See all these yummy fillings inside the pan-fried eggs. The fried rice absorbs all the flavours of chicken and tomato sauce. The omelette outside is just cooked and retains its smooth texture. This dish usually goes with some baby greens. Mix chicken with marinade for 15 minutes. Rinse frozen green peas in boiling water and drain well. Season with salt. Set aside. Heat oil in frying pan over medium heat. Add onion and cook until translucent. Push to sides of pan. Add some oil in the middle of pan. Saute garlic until fragrant. Add chicken, cook until colour changed. Pour in wine and stir well. Let chicken absorb wine. Toss in mushrooms and stir well. Add tomato, ketchup, bay leaf, and cook until sauce reduces and thickens, uncovered. Taste by yourself. Season with salt and pepper. Add green peas and cook briefly. Discard the bay leaf. Add rice, separate them and mix well with sauce. Transfer into three bowls for later use. Beat 2 eggs with cream and salt. Heat oil in a non-stick frying pan (skillet). Pour the egg mixture in pan , quickly stir the egg with chopsticks. Immediately, spread the egg and make a round omelet by moving the pan around. When the egg is 90% cooked, remove from heat. Place one bowl of fried rice in the middle of the omelet. Fold top and bottom sides of omelet over the rice. Tilt the pan and let the omurice slide to the side of the pan. Hold a plate next to the side of pan. Quickly turn the omurice over to the plate. Drizzle some ketchup on top of omurice before serving. Garnish with baby salads, sweet basil if you like. Repeat this step to make three plates of omurice. When it just sets, you can place the rice and other ingredients inside. At this stage, keep the cooking time as short as possible because you don't want your eggs turn tough. I love rice cooked this way, real popular here at Malay Food stalls! Beautiful rice in a parcel. I remember eating something like this back home, but with chili sauce....very delicious. Love this dish partly because I'm always expecting surprises from opening the egg skin. But there was an unpleasant experience with which I was put off by the heavy sauce in the dish. The rice with sauce here looks just right and, nice presentation again. I love this. It can be found at a lot of korean restaurants as well! Your omu rice looks delicious. We have something similar in Malaysia, it's called Nasi Pattaya. It's also fried egg with rice but it's usually round or just a large piece of egg covering the top of the rice. Very famous in Mamaks or our local Malay-Indian Hawker stalls! 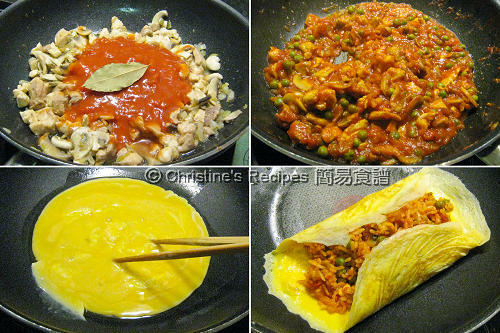 I love the idea of a delicious rice inside a fried egg wrap - excellent! I always love this rice-egg roll-up. Now you have me crave for some! I've had this before but I did not cook them at home. Sometimes, they drizzle some Jap curry over the egg...and ooh-so-good! I love your recipes here especially this one, although the first time I tried to make this, I couldnt wrap it as nice as yours :)Your site is really wonderful,I'd love to guide Foodista readers to your site if you won't mind.Just add your choice of foodista widget to the end of this post and it's all set, Thanks! I am very intrigued by this dish; it sounds so delicious and it looks so sophisticated! Love the fried rice in an omelet - it just sounds so tasty. I'm going to try to make this tomorrow for dinner ! hi christine, is there any other way to substitute the japanese white rice wain? cause i cant find it.. planning to make this for tomorrow dinner! You can use other white rice wine, even the Chinese one will do if you don't have the Japanese one. Even though i tried cooking without the chickens, the taste is still as great. trying the ingredient but the egg wrapping came out a bit dry....can thicken cream be substitute for thick coffee creamer? wasnt sure exactly what thicken cream meant. Any kind of cream will work, as long as you like it. It's for making the eggs smoother. This looks like Nasi Goreng Pattaya (Pattaya Fried Rice) commonly found at Malay shops here in Malaysia. It's one of my favourites. Thanks for dropping by my blog with your comment. Appreciate it. What is thickened cream, where can i buy and is there any specify brand? I used Paul's Thickened Cream. You can replace with milk. You can use a rice cooker if you have one. If not, you can cook the rice on stove or steam in a wok. Hi Christine, when you say 'light soy sauce', does it mean Maggi soy sauce and not Japanese soy sauce ? I am a little confused between the 'dark soy sauce', 'Japanese soy sauce' and 'light soy sauce' you use in your recipes. You can use Japanese soy sauce or any other soy sauce with lighter colour. hi Christine,what kind of thickened cream can i use?? is that same as heavy cream?? You can use any brands of thickened cream or pouring cream. Heavy cream will work. It's more creamy and flavoursome. Do you use canned diced or whole tomato or tomato sauce? I used canned diced tomato for convenience.